Bess (Shannon Tarbet) lives with her father Murray (Matthew Broderick) who is suffering from Parkinson’s Disease. Her mother Carolyn (Chloë Sevigny) also lives in the house but Bess can’t see her, and believes that she is a figment of her father’s imagination. Attending therapy with Farmer (Benjamin Walker), who she has a romantic relationship of sorts with, Bess is introduced to his troubled neighbour Russell (Aidan Turner), who is debating whether or not to end his life. Farmer sees an opportunity for Bess and Russell to help one another but the only problem is, Bess can’t see Russell either. 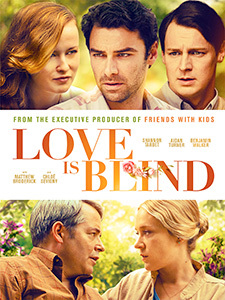 Love is Blind is a very quirky movie written by Jennifer Schuur. If a linear narrative that explains everything is what you’re after, or a by-the-numbers romantic comedy, then this definitely isn’t the choice for you. Love is Blind is deliberately obtuse with much more in common with a Wes Anderson film than a Nora Ephron classic. The premise is a bit bizarre. Just reading the synopsis left me scratching my head but once you settle into the quirkiness of the film, you kind of just choose to go with it. Early in the film Bess and Murray argue over the existence of Carolyn. When the film is shown from Bess’ perspective, Carolyn simply isn’t there but when it’s shown from any other character, Carolyn is there to see plain as day. 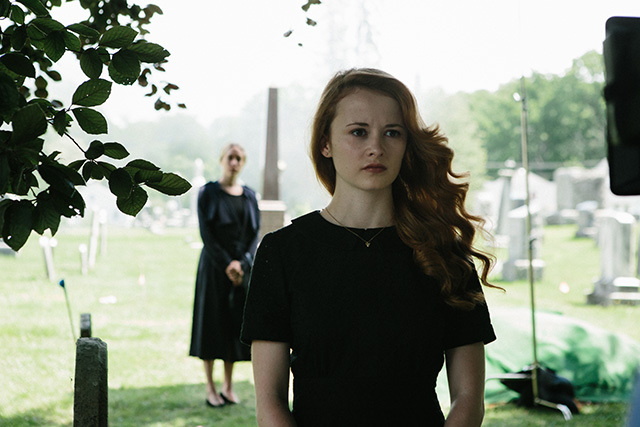 For Bess though, her mother died in a car accident and ‘left’ her, something she can’t seem to get past. Shannon Tarbet is quite wonderful as Bess. She doesn’t flinch in the scenes she’s in with Sevigny or Turner, even though her character can’t see them and often they are in her face. Tarbet paints a complex character that you root for, even when you’re not entirely sure why. Is Bess completely delusional? Perhaps she’s suffering from an undiagnosed illness? It may frustrate some viewers to know that you don’t really get much of an explanation but that’s not really the point of the film. Aidan Turner shines as Russell. He shares some scenes with Benjamin Walker, who is also very good in the film, that were highlights for me. It’s nice to see Turner tackling something a little less serious than what we’re used to seeing him in. Despite not being visible to Bess, Turner’s Russell has a believable chemistry with her. Turner really embraces the quirky nature of Love is Blind and he’s a joy to watch on-screen. Love is Blind won’t be everyone’s cup of tea but it you want to see a refreshing twist on a romantic comedy, you need look no further. The direction is very good, the cinematography beautiful to look at and the cast brilliant. I would have liked a bit more of an explanation about Bess’ condition by the end of the film but that’s a small gripe about an otherwise delightful film.